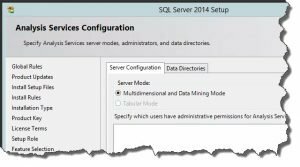 SSAS Tabular available in SQL Server SE? 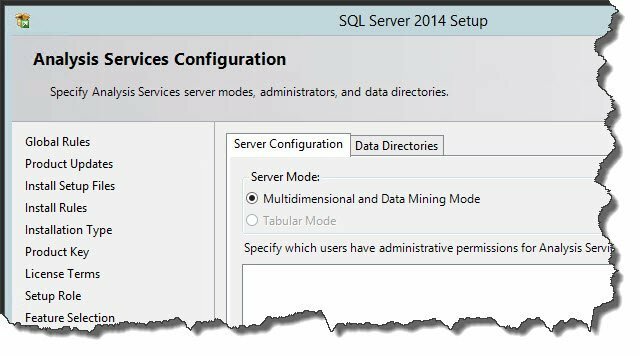 There’s a lot of confusion on the web with people asking if or why they can’t install SSAS (SQL Server Analysis Services) Tabular data model on their server, thinking you can’t install both Multidimensional (SSAS MD) and Tabular on the same server etc. Especially as only MD is offered by default on new installations and already installed on any new Azure SQL Server. After all, isn’t Tabular the model we are all supposed to adopt now? Well, let’s face it, it is – even hard-core BI MVPs say so, and MD is often high-maintenance overkill now we have fast servers and VertiPaq. Anyway, if you’re used to installing multiple Instances of SQL Server, you’ll know you can probably have both running no problem – hey, you can even have completely independent SQL Server OLTP DB Engines on the same Windows server. However, the wake-up call is finding out that Tabular is not included on any Standard Edition lower than 2016! This is not just Microsoft confuddle, it’s confirmed by them – just change the version number and scroll down 20 pages to the “BI Semantic Model (Tabular)” section… older versions are simply not licenced for Tabular. So 2016 is indeed a revelation (unless you spent tens of thousands on older Enterprise Edition)! Oh, and if you want to use your on-premises data published on PowerBI so your users can access through the browser on the Microsoft portal, good news – the Enterprise Gateway has now been upgraded to do so. Now you may just be wondering if you need the Pro ($10 per month UK equivalent) or can stick with the Free edition… that’s more complex (many dependencies), so another post soon.